Hindsight is a wonderful thing. It is also probably the most frustrating word in the English language. As a business owner, mistakes come with the job. No one has all the answers all of the time and as the cliché goes, experience really is the best teacher. But what if you could bypass some of the things that could potentially go wrong? Heeding the advice of others and learning from their experiences won’t necessarily mean you will escape all of the pitfalls that other business owners have faced. However, they could help you to avoid some of them. In a recent survey, respondents were asked to share the things they wish they had done differently during the early days of starting their businesses. According to the survey, 33% of business owners regretted their delay in creating a website for their business, while 29% admitted they wish they had gotten to grips with technology sooner than they had. 1 in 4 respondents (27%) stated that they wished they had sought additional help far quicker in the form of new team members, rather than attempting to manage existing workloads on their own. But one of the biggest factors concerned finance. The survey found that 26% of business owners wish they had obtained financial support and advice far earlier than they did. Indeed, while 6 out of 10 (59%) of respondents cite managing their finances as being one of their biggest concerns, business owners typically spent less than 45 minutes each day performing a finance-related task. Part of the reason for this was because of the complexity of what was what, from insurance and compliance to processing payroll and credit control (58%). The survey recognised that new business owners typically engage an accountant and adopt some financial accounting systems early doors. Yet experienced entrepreneurs prioritise engaging with a finance expert much earlier than new businesses who tend to wait upwards of five months before doing so. Why is this? We have all heard the phrase, revenue is vanity, profit is sanity and cash is reality. Recruitment entrepreneurs need to understand the numbers – or at the very least understand the cash implications for every transaction that goes in and out of the business. Financial management is not easy, especially when it comes to employing staff and managing a contingency workforce – getting your head around the compliance, HMRC payment, National Insurance Contributions and all manner of other important considerations is not plain sailing. It can be time consuming and demanding, which is why experienced recruitment business owners opt to outsource this key area of the business to those with the experience and know-how to effectively manage this side of the business for them. In doing so, they can focus more of their time on engaging candidates and winning new business. Money might not be your greatest motivator in business, but when it begins to run dry you’ll very quickly find that everything else is put on hold. Experience counts for a lot, so it simply makes good business sense to ensure you partner with the right people who can help you with the right things at the right time. 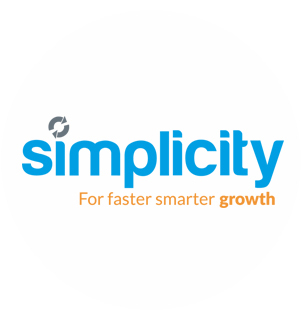 Simplicity is the ‘go to’ Growth Partner for start-up and existing recruitment businesses. They help recruiters achieve Faster, Smarter Growth by removing barriers and providing them with the critical tools needed to run long term, successful and profitable businesses. They exist to make the business of recruitment as simple as possible, by providing recruiters with a comprehensive range of market leading, award winning and ISO 9001 certified financial, back office and support services. As part of their solution we offer ‘GEMS’ the industry’s first FREE end-to-end Recruitment CRM and Workflow Solution. GEMS technology combines your front and back office systems into one seamless process. No longer do you need the hassle and cost of a standalone CRM and other systems to run your business. From CRM to payroll, right through to reporting, GEMS provides the complete technology solution and best of all its completely FREE to Simplicity partners. Time is a valuable asset to you and your business. Partnering with Simplicity will give you all the time you need to focus on what you do best; win new business, manage existing clients and source the best talent. Simplicity can help you to achieve your growth aspirations and make your recruitment business a success.